Recognizing that in the 900 years since Hildegard's passing, her life and works have not been immune to the diversity of interpretations. It is the goal of the ISHBS to make available the best source materials and critical editions for its members (Academic Sources) to be used for further research and discussion in topics. The page on Spirituality is an inclusive heading to provide links and sources on the variety of ways Hildegard has been interpreted through the ages. Hi, I wonder if you can advise me. I am retired, and spend some of my time making ancient spiritual classics available to the modern reader. Usually I download free texts; sometimes I scan in old books. Then I print them and bind them. 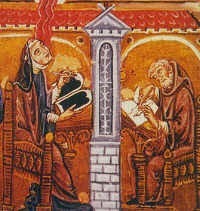 I'm looking for material about St Hildegard which is a) out of copyright and b) in English. Do you know of anything like that? I'm happy to scan myself if I can find a hard copy. Unfortunately, because Hildegard only became well-known in the English-speaking world in the second half of the 20th century, there are not, as far as I know, any English translations of her works published before 1923. (1) Hildegard's poetry / music, as published through this website under the Music tab. (2) The chapter summaries to her Book of Divine Works, also available on this website through the Liber Divinorum Operum tab.